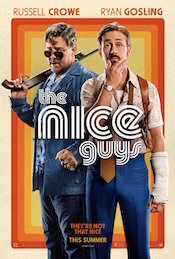 The Nice Guys began development in the early 2000s as a film set in contemporary Los Angeles, but the project went nowhere and then was retooled as a CBS TV show, which also never materialized. After director Shane Black’s success with Iron Man 3, he was able to secure financing for the project as a feature film set in the 1970s. The Nice Guys reunited Shane Black with producer Joel Silver, which both paired on Black’s 2005 first directorial effort Kiss Kiss Bang Bang and his screenplays for The Last Boy Scout and Lethal Weapon. Joel Silver’s Silver Pictures arranged the financing for The Nice Guys and partnered with billionaire Ken Kao to co-finance the picture through his company Waypoint Entertainment. 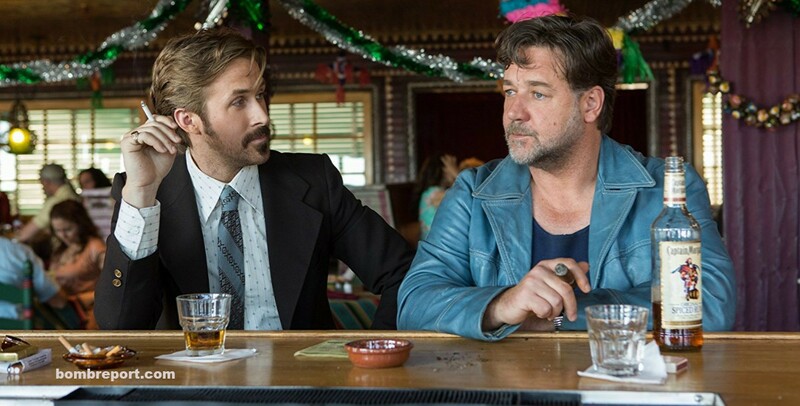 In an interview with Kao, the budget for The Nice Guys is revealed as $60 million. Ken Kao sold the pic to international distributors through his sales company Bloom. Warner Bros attached themselves as domestic distributor and Bloom sold the pre-sale rights at the American Film Market in 2014 and sold out every territory, which would help limit their exposure to the ambitious budget for an indie. The music publishing rights company Cutting Edge Group also invested in the movie and had setup numerous investments in feature films (The Infiltrator was another 2016 investment) and in return they get the music publishing rights. Cutting Edge would also handle scoring duties, clearances and music supervision and see returns from the soundtrack and sheet-music sales. Warner Bros initially set the release date for June 17, 2016 but swapped the dates with another action-comedy Central Intelligence and moved The Nice Guys to May 20 and soon Neighbors 2 shifted to that date. Despite only having domestic rights on the line, Warner Bros heavily invested in a strong marketing campaign for the movie, but The Nice Guys was tracking soft up to its release, with a $10 million opening expected. Reviews were very positive and it opened just above expectations with $11,203,270 in 2,865 theaters, but The Nice Guys and Neighbors 2 ate into each other’s audience and both pictures suffered. It placed #4 for the weekend led by new opener The Angry Birds Movie and holdover Captain America: Civil War. The pic declined 41.8% the following weekend to $6,516,234 and 47% in its third frame to $3,453,344. The Nice Guys closed its domestic run with $35,261,763, sadly continuing the decline in attendance for adult skewing mid-budget pictures. Warner Bros would see returned about $19.3 million after theaters take their percentage of the gross, which does not cover their P&A expenses. The Nice Guys pulled in soft numbers overseas for the many distributors who snatched up the expensive rights at AFM. The reported offshore cume was only $26.3 million. Rented it today from Redbox. It’s a very funny, good movie. It’s too bad when a good movie bombs at the box office. I’m guessing Angry Birds and X-Men stole this movie’s thunder. I haven’t seen this one, but I heard good things about it, shame that it flopped. And now The Nice Guys has closed stateside at $35.26 million.